I don't know why I decided to design some new slippers today when I have so much to do to get ready for my upcoming trip! I have about a dozen mini-cupcakes to make for a Little Kiwis Nest order, plus packing to do, etc. Features 2 side-buttoning straps and a really cool ribbed detail for a snug fit at the heel. WOW!! ok ,your designs are so awesome...however you are making it hard for me to pick what I will make for gifts..as I keep wanting to add your new designs to my gift list! 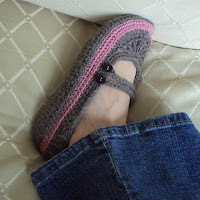 !These will make stylish and comfy slippers for your trip:) very nice. I know your designs are amazing:) I am being selfish and really want this design for me..so when my gifts are complete this will be the slipper for moi!! !..and no trouble:)..if I did not have your shop to purchase from..life would be so boring,making frumpy slippers...you add the spice & divalious design! :)great stuff! I am probably getting ahead of myself, since I have just begun to learn crochet, but I love your patterns and can't wait to try them! I ended up adding almost all of them to my etsy favorites before adding you as a favorite shop. Thanks for giving me fun ideas and motivation to keep at it. wow lisa your designs are so awesome! my sisters loves her pair on shoes! thanks! !